You can relieve a large portion of bamboo to gain clearance as long as your wrapping covers the spots. No updates in a while... but it's not out of my mind. This is a mockup of a fixture for the bottom bracket and dropouts. I want to start from here because I'm so worried about tire clearance. It's much different from Calfee's. 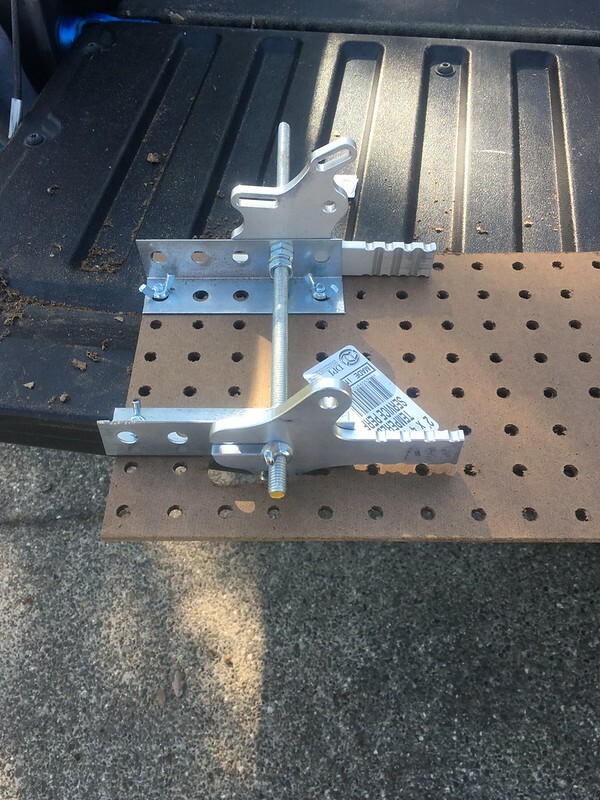 I think I'm going to build it like this, cut it to 8" wide, and then put shelf brackets on it to put it 90deg and 4" centerline from the plan. This specific version didn't quite work for a couple of reasons. First because the 1-1/2" angle iron has holes that are at 1", not 3/4" from the angle, and so I can't get the 5-1/2" spacing I need (the difference between 5-1/2" and 135mm can be cheated with the hole clearances). I could get the right spacing with the angles set outside the dropouts, but then the whole stackup is too wide. The other reason is that the fold in the angle iron is not square. I think I saw some 1.5" box section that should fix both problems. That mounted on 4" centers should do it. The fitting shown is for 2" pipe. 2" pipe is actually 2.375" and that's just over the size of a regular MTB tire, so a fitting that goes around that should be 2-3/4", perfect to set the clearance. I wanted to use a piece of 2-1/2" pipe which is really 2.875", but I couldn't find any. It's an oddball size. I'm back to debating whether to use 29er or 27.5 wheels. The latter are becoming more prevalent and easier to find cheap tubeless versions; it also makes the tire clearance easier, both in the angle of the chain stays, and behind the seat tube. When I look at the Marin Bobcat Trail geometry, the 27.5" version spends the reduced stack to add some reach. Last edited by Darth Lefty; 03-24-17 at 04:38 PM. Consider mocking up around the actual wheel and tire you want to use. You'll want to bend the tangs on those dropouts . Not sure if that's part of the instructions. Any updates on this frame? Not from me. My employer announced plans to close up shop locally by the end of 2018 and move somewhere we don't really want to go, so I'm job hunting in high gear. tough luck on the job loss. I hope you can find a new job soon. I had bad luck with my current all road bike (road/gravel) last weekend snapping derailleur hanger. 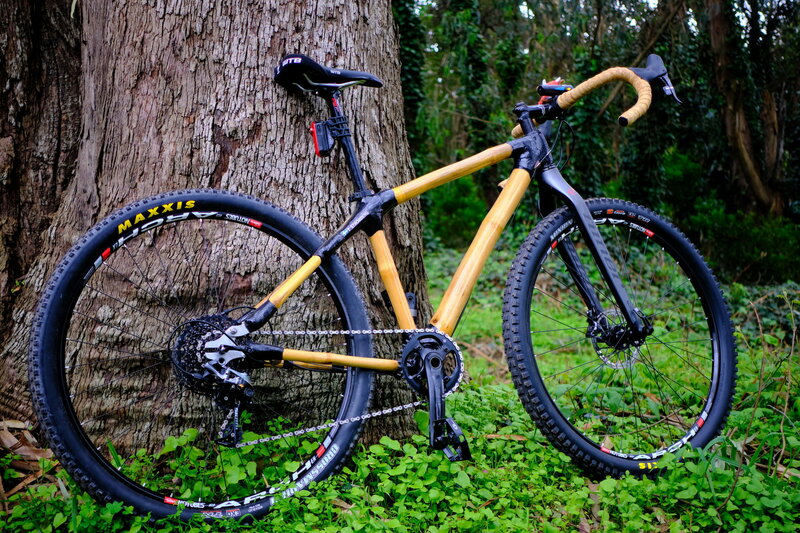 This has ramped me up to buy this kit to build my own dedicated gravel bike. Last edited by Darth Lefty; 06-13-17 at 10:18 AM. *Update*: I moved, and put the kit away for a while. I "finished" it before Thanksgiving, and then discovered that my bottom bracket cup was backwards. I didn't realize they were directional, and the cup that came with the kit had no directional markings. I was very much not excited about having to cut the joint apart, so I put it off again until last month. One unexpected quirk with waiting so long is that the the bent chain and seats stays appear to have straightened themselves out over time. It seems like a common issue with bent bamboo that isn't under pressure. I'm ashamed of the terrible hacks used to fit a 29x2.1" in the back, but it seems to be holding. Last edited by helixbikes; 02-25-19 at 04:19 PM. I only have excuses to offer. We had twins, then we moved. We both work so any spare time spent not actually riding to work has instead been spent doing home stuff. Darth: Having twins is all the excuse one needs. Take care of them! You'll get your free time back at some point. I can't wait to see what you make of it! 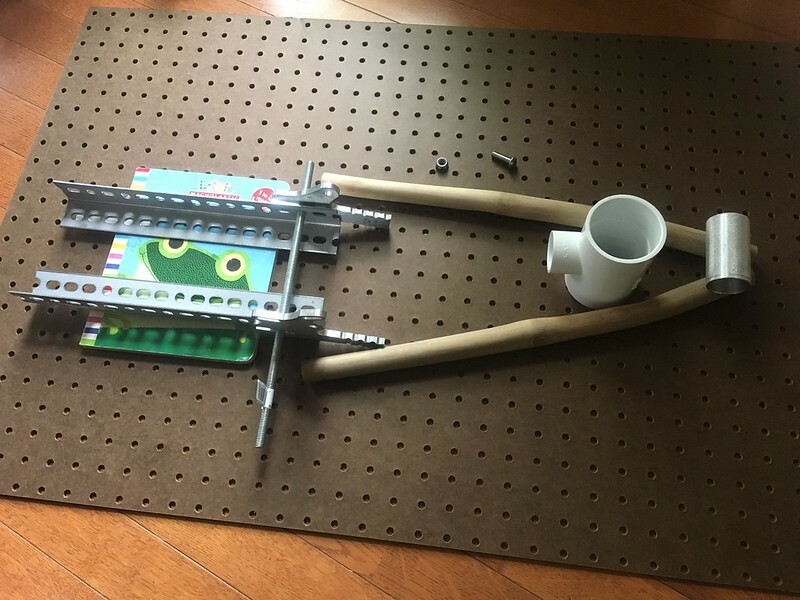 In the mean time, I'll be building a road bike with the https://www.bamboobicycleclub.org/ kit, as Calfee is temporarily out of bamboo stock. For science sake, I'll use their single-use jig, but I plan to use Calfee's mitering technique and probably Calfee's geometry as well. Kids are more important than framebuilding.